As usual, I went into St John Bread and Wine in Commercial Street at the weekend to buy my loaf of bread. Out of the blue, I discovered that Mr Gellatly has been making Custard Tarts. When I was a child, my mother used to buy me custard tarts at the bakers, but in recent years I’ve switched over to the squishy Portuguese variety that I discovered in Lisbon and which you can now find all over London. 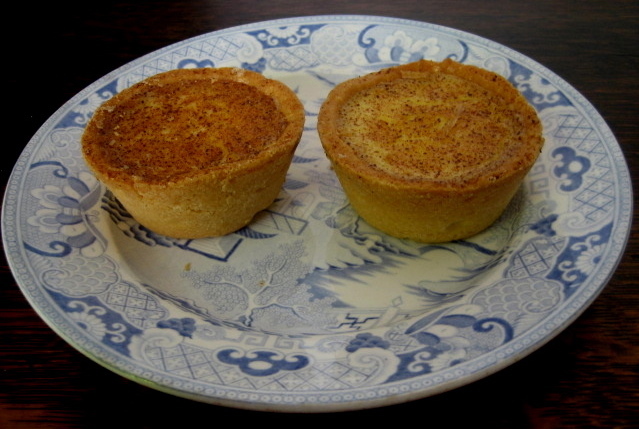 In my childhood, custard tarts came in tinfoil cases with stiff pastry, the consistency of damp cardboard, that contained sweet livid yellow egg custard topped with nutmeg – I loved them. So it was with huge expectation, that I bit into my first St John custard tart, and I was not disappointed. No tinfoil case here, but soft, melting buttery pastry containing the palest creamy egg custard betraying only a hint of vanilla sweetness and leaving a tangy exotic aftertaste of nutmeg. On Saturday afternoon, I settled down in the garden to enjoy my tart with a cup of tea in the sun. Then I found myself doing it again on Sunday, because although I always thought I knew custard tarts, I never knew them at all, until now.